I have added a few photos from the Apple Festival on my flickr page. 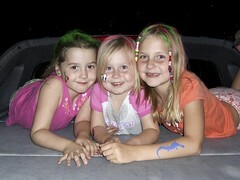 This one was taken at the end of the fun evening with the girls (Linsey, Mia & Olivia) on the back of my truck posing with their colored hair, painted faces, tattoos and such. For the rest of the photos look at the photos tagged "applefestival" on my flickr page.